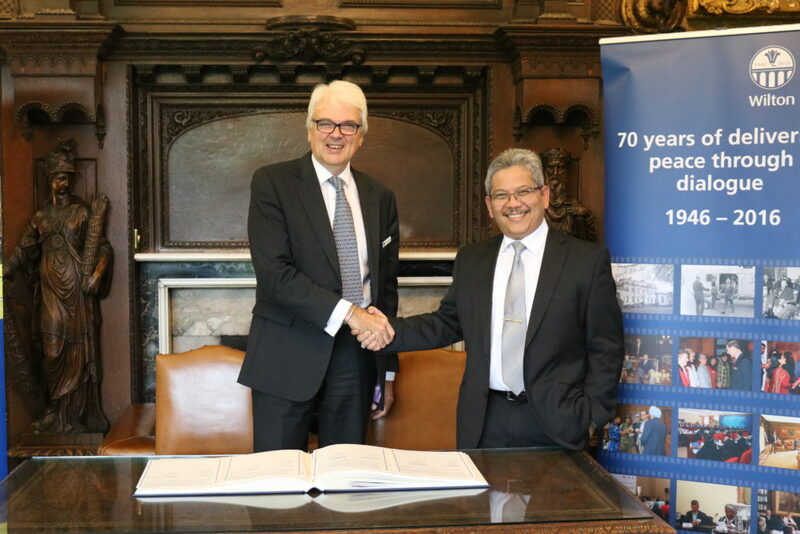 The Indonesian Ambassador to the UK, HE Dr Rizal Sukma, visited Wilton Park today to sign the renewed Partnership Agreement between Wilton Park and The Policy Analysis and Development Agency of The Ministry of Foreign Affairs of The Republic of Indonesia. This agreement has been developed to promote sustained dialogue between the two organisations and their respective countries, as they tackle wide ranging national and international policy issues. The first agreement was signed in September 2012, during our first event in Indonesia, where international experts had convened to help establish new ideas for Promoting sustainable growth in Indonesia. Dr Sukma, who recently started his posting in London, has made many welcome contributions to our discussions in his former capacity as Executive Director of Study, Centre for Strategic and International Studies (CSIS) Indonesia. The signing of this Agreement reaffirms the continued collaboration between the United Kingdom and Indonesia. We look forward to working closely with the MFA and other partners to develop future programmes which focus on Indonesian priorities.